Direct-write diamond patterning; X-ray flash imaging; better photonic chips. Purdue University has devised a new technique that uses a pulsing laser to create synthetic nanodiamond films and patterns on a graphite substrate. The ability to pattern diamond surfaces could one day be used to make chips, biosensors and fuel cells. In the lab, researchers devised a multi-layered film, which includes a layer of graphite topped with a glass cover sheet. 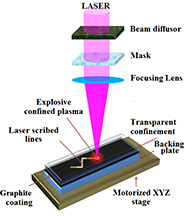 The multi-layer film is exposed to a technology called confined pulse laser deposition (CPLD). In CPLD, a nanosecond laser ablation activates a plasma. Then, the graphite plasma solidifies into diamond. A nanodiamond pattern has been formed at a laser intensity as low as 3.7 GW/cm2. This corresponds to pressure of 4.4 GPa, according to researchers. Technische Universität München (TUM), the Hamburg Center for Free-Electron Laser Science and the Max Planck Institute of Quantum Optics have devised an X-ray flash imaging technology as a means to study the world’s smallest structures. X-ray flash can resolve structures as small as 0.1nm in size, or roughly the diameter of a hydrogen atom. The technology enables snapshots of tiny structures, such as the arrangement of atoms in molecules. 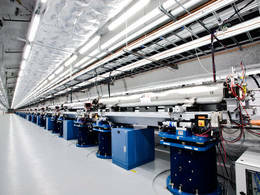 The experiments were done at the SLAC National Accelerator Laboratory in Palo Alto, Calif. Using free-electron lasers, X-ray flashes are generated by accelerating electrons to very high energy levels in linear accelerators. The electrons are deflected in magnets. Then, particles emit X-ray radiation. This, in turn, is amplified until an ultra-short and intensive X-ray flash is released. Researchers can obtain images on structural changes during a reaction by using two sequenced flashes. The first laser flash triggers a reaction. The second one measures structural changes during the reaction. In one experiment, researchers measured ultra-short sub-peaks directly. The individual flashes last only around 800 attoseconds, which is a billionth of a billionth of a second. Pulses with durations of only a few attoseconds would enable researchers to take snapshots of various processes, including the movement of electrons around atomic nuclei. There are several applications for the technology, such as basic research. Medicine is another application. “Ultra-short laser-like X-ray pluses serve not only the investigation of the fastest physical processes at the core of matter, but could, because of their extremely high intensity, also be used to destroy tumors following X-ray diagnosis,” said Reinhard Kienberger, professor for laser and X-ray physics at TU München, on the organization’s Web site. Silicon photonics is a promising technology. But testing and characterizing silicon photonic devices is difficult. This is especially true as device complexity increases. The University of Southampton has solved part of the problem. Researchers have developed a method to find out at which time the light in the chip is at which position. The technique is called ultrafast photomodulation spectroscopy (UPMS). It uses ultraviolet laser pulses of femtosecond durations to change the refractive index of silicon in a small area on the photonic chip. UPMS provides information on complex devices, enabling the chip to be tested at the device level. The technology is based on a localized modulation in the device using pulsed laser excitation. “Optical pumping perturbs the refractive index of silicon, providing a spatially and temporally localized modulation in the transmitted light, enabling time- and frequency-resolved imaging,” according to researchers.